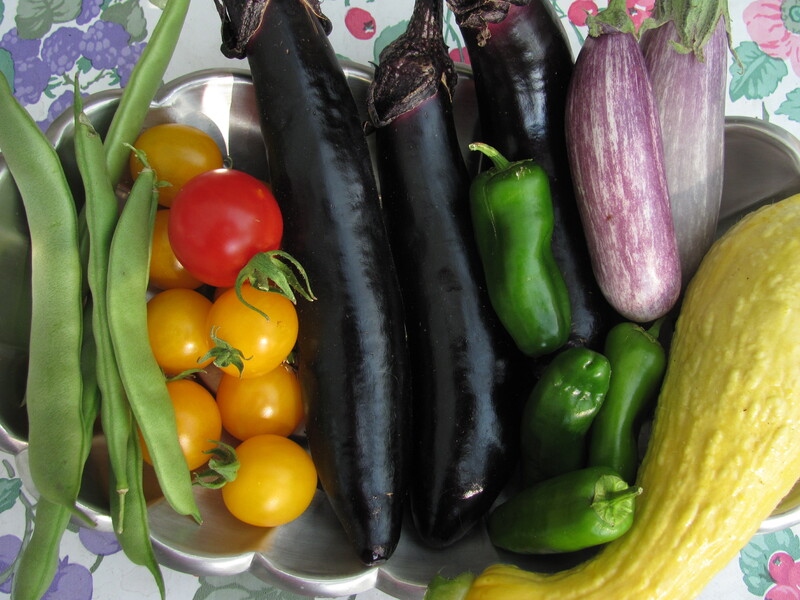 Some of my veggie harvest variety: green beans, cherry tomatoes, eggplants, peppers and summer squash. It’s surprising what I will forget a few months from now as I page through seed catalogs or shop at garden centers. Now is the best time to make notes and analyze this year’s successes and failures. Before doing so, I took a quick look at what two other gardeners do. Along with her garden journal notating weather and garden improvements, Wendy Douglass, master gardener in Cheyenne, has a method for tracking her new perennials. She makes a 5×7-inch card for each, attaching the tag from the nursery, recording where the plant was bought, the date and location planted and any helpful horticultural notes. Wendy also marks each new plant with a palm-sized, flattish rock on which she writes the plant’s name and date planted using oil-based Sharpie markers. In spring, these rocks may become little gravestones for plants that don’t make it through the winter, but at least they aren’t forgotten. And their cards are moved to the “Deceased” file. Catherine Wissner, University of Wyoming Laramie County Extension horticulturalist, tracks the productivity of the vegetables growing in her high tunnel greenhouse by weighing nearly everything. 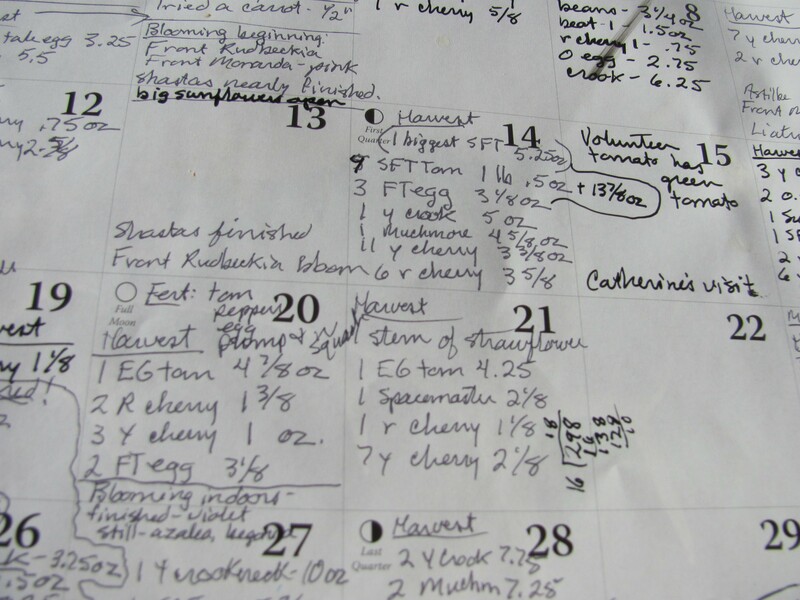 She jots notes in the field all season long, and during the winter, she adds them to a simple record-keeping system she has devised using Excel. My harvest and bloom records are kept on a calendar during the growing season. I like the Excel idea because it is easy to insert new information and add pages. My computer is better organized than the binders I have tried to use in the past. Plus, I can insert digital photos. Here are notes for my vegetable garden. Almost all were plants I grew from seed and transplanted or direct seeded between May 24-27. “Maturity” means number of days between transplanting or direct seeding in the garden until the first fruit is harvested—according to the seed companies. Under “Harvested” are my actual days to maturity as well as the numbers and weights of fruits harvested as of Sept. 8. It wasn’t a large garden, but it provided enough fresh produce for two, plus guests, for over six weeks. “Bountiful,” Pinetree Garden Seed. Direct seeded about 12 plants. Maturity: 46 days. Harvested: 64-107 days, 1 lb. Despite being classified as “bush,” they need a trellis to better protect them from slugs. I removed all but two plants after the initial damage. “Early Wonder,” heirloom, PGS. Direct seeded 3 by 4 foot area. Maturity: 50 days. Harvested: 60-90 days, 1.3 lbs. plus very edible greens. 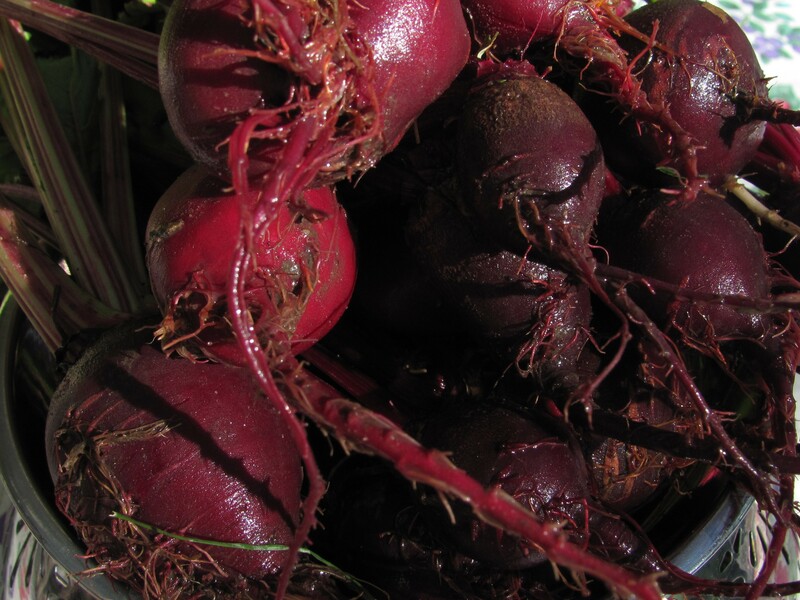 Remember to thin so the beets get bigger. Both could have used floating row cover to protect them from cabbage butterfly caterpillars–cabbage worms. There was too much shade after the tomatoes grew up. —–“Pak Choy,” Bounty Beyond Belief. Transplanted 6. Maturity: 45-60 days. Harvested a few leaves before the plants bolted in June, then other leaves were eaten by pests. —–“Red Express,” Johnny’s Selected Seeds. Transplanted 6. Maturity: 63 days. Harvested: 60 days, 2 ounces—no heads really developed and most of the leaves were holey. “Parisian,” heirloom, PGS. Direct seeded 2 by 3 foot area. Maturity: 55 days. Harvested: 60 days, 2 oz. Have taken only samples so far and will harvest the rest after frost. For all the work and water, I want bigger carrots next time, though these are cute little round things. Grown under and over wood lathe A-frame trellis, barely affected by hail. —–“Spacemaster,” PGS. Direct seeded and only one plant sprouted. Maturity: 59 days. Harvested: 85 days onward, 3 fruits, 0.75 lb. Many flowers, but they didn’t seem to get pollinated. Not very tasty. —–“Muchmore,” from Kathy Shreve. Transplanted 1. Maturity: 54 days. Harvested: 74 days onward, 19 fruits, 4.4 lbs. so far. Tasty. —“Sweeter Yet,” from Kathy Shreve. Transplanted 1. Maturity: 48 days. Harvested: 60 days onward, 5 fruits, 2 lbs. Also tasty. Used containers on the hot and sunny patio, with potting soil amended with leaf compost. Hail slowed flowering. Expect only a few more fruits before frost. —–“Orient Express” hybrid, JSS. Transplanted 3 in containers. Maturity: 58 days. Harvested: 60 days onward, 13 fruits, 2.3 lbs. —–“Fairy Tale,” trade with friend. Transplanted 1. Maturity: 50 days. Harvested: 65 days onward, 25 fruits, 2 lbs. Very pretty purple and white streaks. “Lunch Box Red,” JSS. Transplanted 6 into containers. Maturity: 55 days green, 75 for red. Harvested: 60 days green, 90 days red, 35 fruits, 0.75 lbs., another 51 ripening. Plants in the bigger containers were much more productive. “Cinderella,” also known as “Rouge vif d’Etampes,” from seed saved from purchased pumpkin. Transplanted 1. Maturity: 110 days. Harvested: 107 days, 1 pumpkin, 18 lbs. A second, much smaller pumpkin succumbed to a fungus before it could mature. “Yellow Crookneck,” heirloom, PGS. Transplanted 1. Maturity: 42 days. Harvested: 70 days onward, 22 fruits, 6.5 lbs. so far. “Australian Blue,” from seed saved from purchased squash. Transplanted 1. Maturity: 110-120 days. Male and female flowers didn’t seem to bloom at the same time. A fruit began forming mid-August and probably won’t ripen before frost. Started three of the four from seed and planted 1 each in containers with potting soil amended with leaf compost. Needed fish emulsion fertilizer every week or two. —–“Gold Nugget” yellow cherry, determinate, PGS. Maturity: 55 days. Harvested: 60 days onward, 137 fruits, 3 lbs. so far. —–“Large Red Cherry,” indeterminate, American Seed. Maturity: 55-60 days. Harvested: 70 days onward, 65 fruit, 3 lbs. so far. A substantial cage would work better than tying it to a stake. —–“Silvery Fir Tree” heirloom, determinate, from Master Gardener sale. Maturity: 58 days. Harvested: 75 days onward, 41 fruit, 8.5 lbs. so far. Tastes fine. —-“Early Girl” hybrid, indeterminate, Ferry-Morse. Maturity: 52 days. Harvested: 83 days onward, 23 fruit, 7.5 lbs. so far. Needs substantial cage for support. Luckily, tomatoes were hard and green at the time of the hail storms and only sustained a few scars. Slugs got most of the beans and infested the cucumbers and squash, but daily examination, beer traps and watering less cut them down from 36 on the worst day to only a few each day. Other problems, such as the fungus on the pumpkin, powdery mildew on the squash leaves, leaf miners on the beet leaves, and cabbage worms on the cabbage, will all benefit from crop rotation. With my garden only measuring 14 by 14 feet, too small to rotate within, I’m thinking about next year planting kinds of vegetables I haven’t tried at all yet: Maybe corn or alfalfa, or maybe more containers in a different part of the yard. I also think damage from hail made my plants more susceptible to disease and pests. I had no weeds, unless you count the cherry tomato that popped up among the beets, or the sunflowers planted by the birds, which attracted bees. My leaf mulch and intensive style of gardening prevents weeds, though I have to be more careful not to provide damp and shady slug habitat. Having harvested 60 pounds of produce as of Sept. 8 from my shady garden, with maybe another 10 pounds of tomatoes still ripening, and given the two hail storms, I’m happy with my production. I’ll continue to keep a lookout for more short-season vegetable varieties. What was your experience this summer? What advice do you have for a novice vegetable gardener like me? Shot me an email. 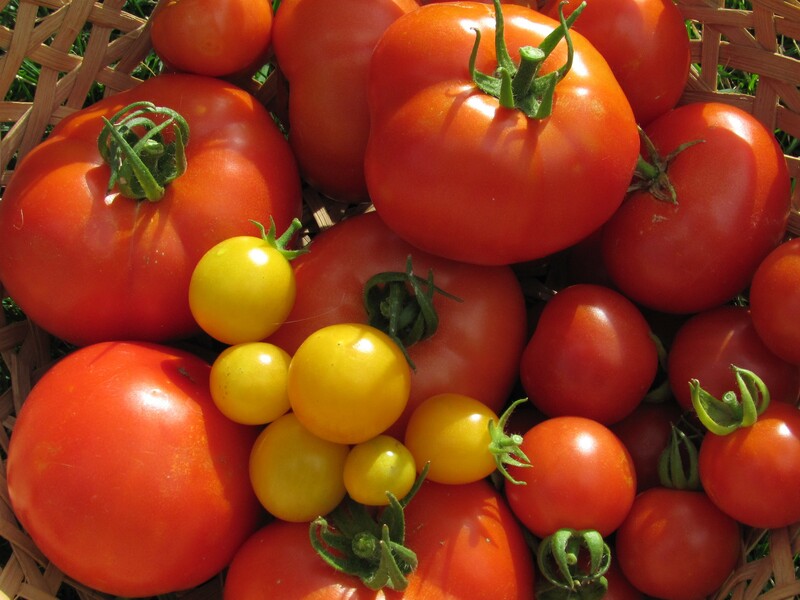 Categories: Garden records | Tags: beans, beets, cabbage, carrots, Catherine Wissner, cucumbers, eggplant, garden records, pumpkin, summer squash, sweet peppers, tomatoes, vegetable diseases, vegetable pests, weeds, Wendy Douglass, winter squash | Permalink.